I grew up understanding the game as something you did in the backyard on Sunday afternoons after church. Now, I just watch and shake my head – at the action, the athleticism, …and the spandex! 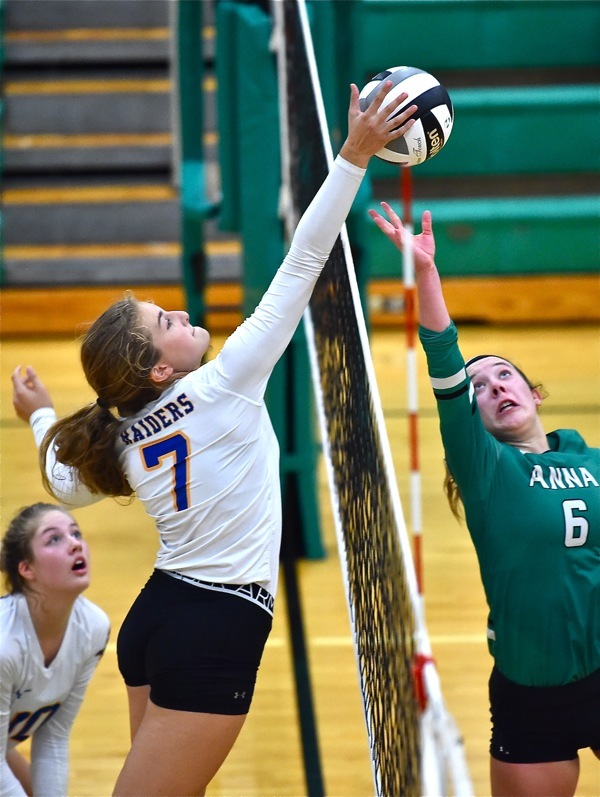 A reader and grade school friend from southern Ohio called me the other day pursuant to this fall’s coverage of MAC and Shelby County League volleyball – with St. Henry, Bremen, Marion Local, Fort Recovery, and Jackson Center all ranked in the top ten of Division IV. Well, he’s right. In Lawrence County, Ohio, in the early 60s the only volleyball that anyone knew about was the recreational kind that you played in the backyard on Sunday afternoons after church. I remember well the girls and aunts in the family playing in dresses, while trying not to sweat – not lady-like. And it was very soft, no ‘kills’, and all underhand serves. Occasionally someone would twist an ankle and the game was immediately ended, out of guilt and remorse. The only thing that I really understood about volleyball back then was that it was a bad thing when the ball hit the ground. And, you actually tried to hit the ball in the direction of someone, and softly enough to let them hit it back to you – to extend the point as long as possible. It was polite, and you wanted to make as many people feel involved as possible. Yes, I remember. But that’s a helluva’ lot different than the volleyball you’ll see this weekend in the opening rounds of the OHSAA tournament, being played at various area schools. 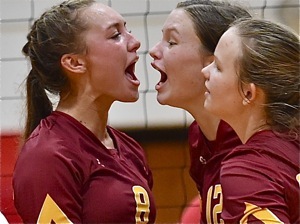 Far more spirited now…New Bremen’s Macy Puthoff (above, left) and Claire Pape celebrate a point in a recent New Bremen win. And yes, it is a big deal in this part of the country. If you need proof of that just count the number of state titles won in the past couple of decades – by St. Henry, Marion Local, Lehman, Versailles, Fort Loramie, Jackson Center, Miami East, et. al. My apologies for leaving anyone out. But I can assure you…it’s not a game that any of my cousins and aunts would want to play now after church on Sunday – not the way today’s game is played. It’s fast. It’s physical. You really do sweat a lot. And you try to hit the ball at someone as hard as you can – that is, if you can’t hit it directly at the floor to score the point. Make someone commit an error and feel a bit of shame and doubt in the process, if you can. Forget about allowing the opponent to feel good about themselves. It just isn’t done. Back then, people might play a total of two hours a year. Now, the top female participants play twelve months a year. It’s competitive to the point that if you don’t you might not make the fall roster. So, your off-season is consumed by ‘JO’ (Junior Olympic) play, constant travel, and training to become faster, stronger, and more efficient with your court movements. Back then my Aunt Doris would come off the ground maybe six inches on a good jump to hit the ball. More athletic…there’s a reason why you have to wear spandex. The game is more athletic, demanding greater freedom of movement. Last year I watched New Bremen’s Paige Jones explode off the floor a good three feet (maybe more), and elevate herself a couple of feet above the net to spike the ball on a severe angle down through the helpless defense on the other side. Aunt Doris would not have approved, nor would she have like the term “kill”, the modern term for a shot like that. In that same game I also observed Jones hit the ball so hard that an opposing player had to dodge abruptly to avoid being hit directly in the face with a seventy-mile-per-hour kill (or spike). Aunt Doris would not have approved of that, either. But that’s the way it is now. Do as much damage to the other side as you can. The first team to 25 wins! There are so many good players in the area now, and around the state, that you can’t name them all. That’s a lot different from the days when volleyball became an OHSAA sport back in the mid-70s. Back then if there was one really good player in the county it was big news. Now, there’s at least one really good one on every team – and usually more than one. Now they’re measured in terms of being collegiate prospect potential. Paige Jones, for instance, is now at the University of Michigan (full scholarship). Miami East’s Jonni Parker is in that same class of athlete, and she’s now playing at Penn State (full scholarship). I’m pretty sure…no one in our family backyard games was ever even noticed, let alone recruited. I’m also pretty sure that none of the girls and ladies in those games would have worn the modern, form-fitting spandex uniforms of today’s games. It just wouldn’t have flown back in the 60s – too much skin and form showing. Frankly, I understand why spandex is worn today, because it stretches and allows so much freedom of movement. But it doesn’t look like something I’d personally want to wear. Aunt Doris wouldn’t have been caught dead in a pair of those shorts. She preferred…”pedal-pushers”! 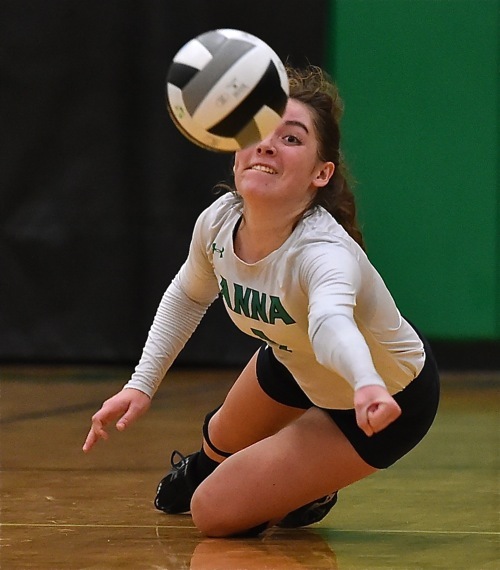 Aunt Doris would never have hurled herself at the ground to keep an opponent’s shot from touching, either, in the manner in when Anna libero Abby Counts presently does. And Counts doesn’t just do it once a game, but throughout the match. That’s what “liberos” do. 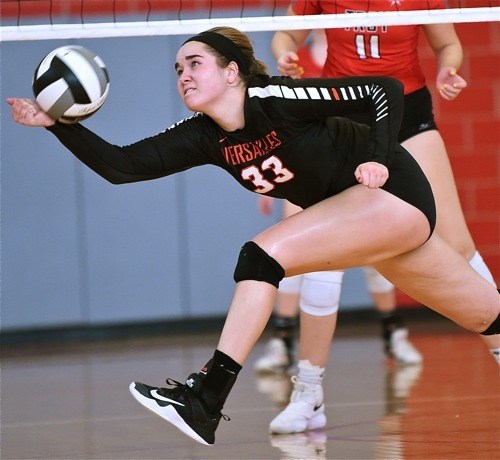 They’re defensive specialists that are willing to give up their body, suffer bumps and bruises – anything – to keep the ball from hitting the floor. Last year I saw one dive and strike her chin on the floor, immediately opening up a nasty cut from bone breaking through the skin. There was blood, yes. But there was also a satisfied smile, pride, and a sense of accomplishment as that player was helped to the locker room to close the gash with stitches. Had it not been in the final set of the match I’m sure she would have returned to play. Bumps and bruises…Anna libero Abby Counts strains to save a point in a recent Shelby County League match. And as to those who rise above the net to try to block shots…most just get their hands and arms in front of the opposing shot. But some of the really good jumpers put their mugs in harm’s way, as well. Paige Jones could do that. But no thanks! No, it’s not the same game I grew up knowing. And I admit it now…I know so little about the strategy of modern volleyball that I don’t even try to ask about rotations, passing, assists, middle and outside hitters. But hey, anyone that can get to the ball and hit it back…it doesn’t matter where you hit from, not to me. It’s a little like basketball; if it goes through the hoop, it’s a good thing. My point is, it’s very entertaining, except for the screaming. The girls tend to do more of that than the men do, and there are leagues and competition for the men’s volleyball, as well. But Aunt Doris wouldn’t have let Uncle Ross play the way men play now. Way too fast and physical. And I don’t think he could have gotten out of the way of a 90-mile-per-hour spike. There would have been blood, with no smile, no pride, and no sense of accomplishment. If you want to see for yourself, there are no less than six area teams competing this weekend that are ranked among the best anywhere in Ohio. Unless you have an aversion to spandex…it wouldn’t do you any harm to go watch.